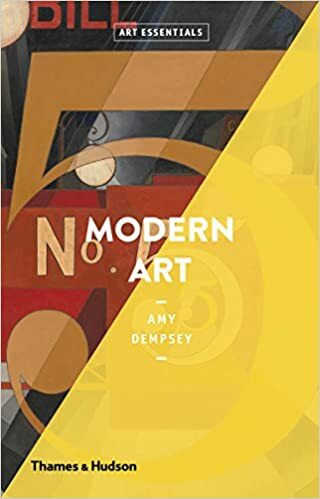 Modern Art by Amy Dempsey is another book from Thames & Hudson's Art Essentials series. The previous book I reviewed, Looking at Pictures, looked at art in general and their meaning. Modern Art looks at, well, the Modern Art era. Collected within this 176-page paperback are 68 styles, schools and movements from the western modern art. Every two pages is devoted to a certain style and movement so the amount of text included is just enough to introduce that particular movement. Some of the more popular styles or movements are Impressionism, Art Nouveau, Symbolism, Expressionism, Cubism, Art Deco, Surrealism, Pop Art and more. In addition to those, there are also many that I've never even heard of, such as Synthetism, Vienna Secession, Purism, Neue Sachlichkeit, CoBrA, Op Art and more. This book is not meant to be exhaustive. It's designed to be a quick guide to Modern Art and the text is written for people who want to know a bit more about the art scene without going too much in unnecessary depth. The book serves as a good starting point for those who want to explore certain art movements in further detail.